When geraniums become stringy and misshapen, they need pruned. The stems will contain leaves that exist on the tips, and the dead shoots and leaves will make the geranium unsightly. Pruning geraniums allows them to grow into healthy flowers; it also encourages new growth after the winter season passes. Geraniums cannot withstand a hard winter, and often require overwintering to protect them from harsh weather conditions. Once you finish pruning the geraniums, remove the cuttings to grow new plants. Prune the geraniums once the threat of frost passes. Prune the geraniums once they finish blossoming. Begin removing any dead shoots and leaves. Use swift cutting motions to remove the dead materials. Start from the base of the flower. Inspect the stems and remove the dead stalks. Cut away any shriveled or dead material. Make crisp and clean cuts with hand pruners. Cut the dead material ¼-inch above a live leaf. Remove leggy stems by cutting the back to 3/4th of their size. Try to cut the stems where the tissue is tan and not as soft. Cut back all the stems to 4 inches in length. Continue to prune leggy stems until 6 to 8 weeks before the first autumn frost date. 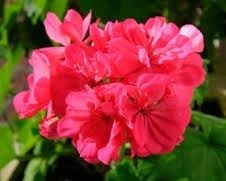 Remove cuttings when you prune the geraniums. Cut 2- to 3-inch sections and place them in a mixture of sand and peat moss. Add plenty of water and cover them with a plastic bag. Once they grow roots, ensure that they receive sunlight. Discard any dead material that you cut, or it will begin to mold next to the geranium, which will ruin the soil.